As if it were ripped from the pages of the bible and thrown into the ocean, a real-life replica of Noah's Ark is ready to hit the open waters. 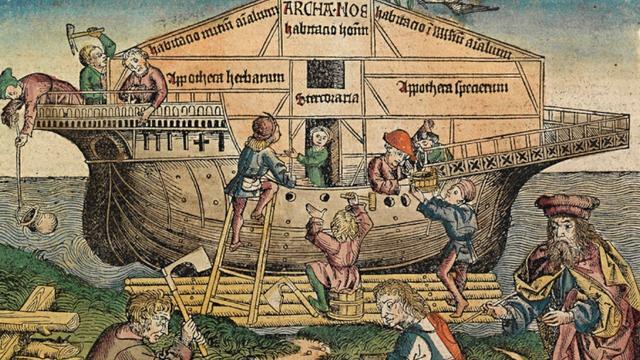 Dubbed "Johan's Ark," in honor of the ship's creator, Johan Huibers, the vessel came to life after the carpenter dreamed a massive flood took out an entire region in his native country, Holland. His giant masterpiece has the same dimensions of the Ark mentioned in the Bible, clocking in at an astounding 95 feet wide, 75 feet high, 410 feet long and can hold up to 5,000 people at once. Longer than a football field and as tall as a five-story building, the Ark has been docked in the Netherlands and has been open to the public since 2012. Huibers' is ready to take Noah's story on the road, however, and has set up a foundation so he can bring the Ark of Noah to Brazil for the Olympic Games this summer, and then later to more ports throughout South, Middle and North America. According to a press release, "once in Brazil the Ark will be using techniques that include virtual and augmented reality to tell original different biblical themes and stories in an interactive and challenging way." The ark will play host to various attractions and exhibitions based on Bible-based stories. To donate to the The Ark of Noah Foundation, click here.